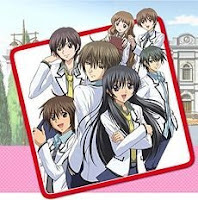 Also known as S.A, this anime is adapted from a shōjo manga by Maki Minami. Ever since their pro-wrestling loving fathers introduced them to each other when they were six years old. Hikari Hanazono has always been second to Kei Takishima. Having the assumption that she was the best in wrestling, young Hikari challenged Kei to a wrestling match only to be thoroughly defeated by him. Ever since that fateful encounter, Hikari swore to beat Kei in everything - school grades, sporting events. As a result,in order to achieve this, she enrolls in the same school as Kei, Hakusenkan, an ultra elite school, that costs her carpenter father a lot of money. Since elementary, Hikari and Kei are the top two students in the school, with Kei holding firmly to the number one position. While Hikari considers Kei to be an improtant firends and rival, she is completely oblivious to the fact that Kei loves her. The story primarily focuses on Hikari and her constant attempts to defeat her one and only rival, Kei, and how she finds love in the process of their rivalry.